Window Decals for Cars and Vehicles. Suitable for Home and Business. All vinyl decals are digitally printed in full color. The material has an adhesive backing so it can stick to lots of different medias, including metals and windows. Some of the most common decal uses include vehicle graphics, window displays, manufacturing companies, safety warnings, and bumper stickers. You can get square cut decals, or shape cut decals. You can add your company name, address, phone number, email address and website. You can also turn your company logo into a sticker. Custom window graphics are a great way to turn unused window space into an effective form of advertising, dress up your home or vehicle windows, and help reduce energy usage at the same time. 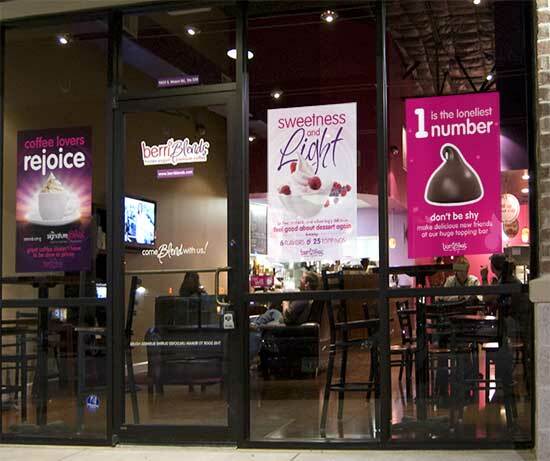 Window clings and window decals are very common for advertising in fast food restaurants, retail window displays, new construction and remodeling, and other places where the use of window space is possible. Large window graphics and decals can have a huge visual impact that customers are sure to notice. Window graphics are one of the first things a customer sees when they approach a business, so they are a great way to attract attention, advertise promotions or special events, or provide useful information. They are also a great way to change the look of a store front in a dramatic way while reducing energy usage. When windows are covered with our View Through Adhesive Vinyl, which looks solid from the outside, but can be seen through from the inside, the material blocks up to 80% of the sun hitting these windows. This reduces the amount of air conditioning necessary to keep the interior comfortable, without blocking the view from the inside of the office. This is the same material that we use for vehicle window graphics which can be seen through from inside so as not to block your view. It's used for window graphics as part of vehicle wraps, but is even more popular as a window graphic for people who want to use the back window of their car, truck or SUV to advertise their business or just dress up their vehicle with a favorite photo or design. Also for home or business use are window clings that are designed to provide privacy, while allowing you to convey a message or decorate a window at the same time. We have many different window graphic and window cling materials that can be printed to provide privacy. These types of privacy graphics allow some light through, but prevent a clear view, so they're perfect for entries, bathrooms, interior office windows or any other glass surface where privacy is needed.